The Friends of HE Parks Foundation and the Hoffman Estates Park District are proud to announce the Giving Tree program. This program offers individuals, groups, organizations and businesses the opportunity to financially contribute to the Friends of HE Parks Foundation Scholarship Fund. 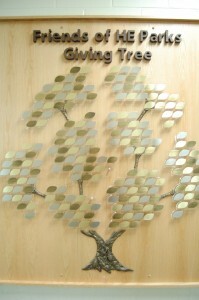 The tree is located in the north lobby area of the Scott R. Triphahn Community Center and Ice Arena. Sixty characters (including punctuation and spaces) using up to four lines can be imprinted on your leaf. Click here for order form and more information. Orders can be taken at Triphahn Center front desk.